Celebrating the end of our Guesthouse: Aug. 12, 2018. This message was sent to our friends around North America recently. For everything, there is a season, the Holy Scriptures tell us: A time to grow and a time to let things pass. The Church of the Annunciation has grown over the last four years. New members have been added. Small groups for Bible and religious study have been launched. The preschool has expanded. We have partnered with Mount Olivet Episcopal Church in Algiers Point (New Orleans) and the non-profits on our campus. Last year, we launched a community Thanksgiving Day Luncheon that fed 150 people who welcomed a place to worship and to eat a delicious meal on Thanksgiving Day. So today, we are writing to say that the season of the volunteer guesthouse at Annunciation will come to an end on August 12, 2018, after the last summer group departs. It is time, my friends. It has been a great run! 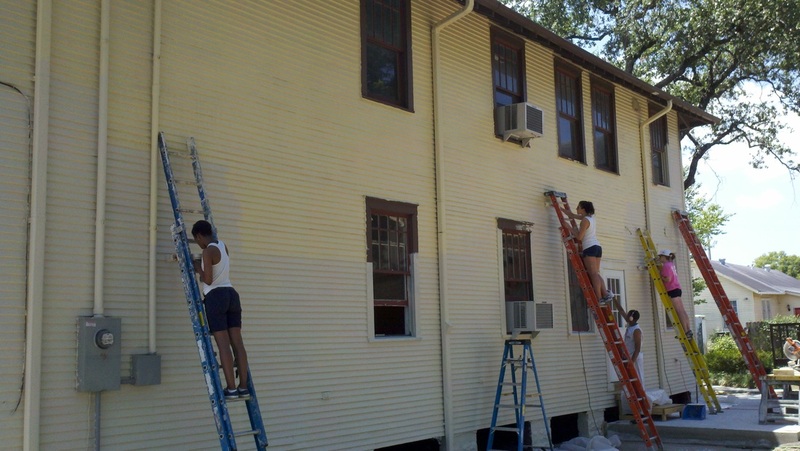 Since the deathly flood that followed Hurricane Katrina, Annunciation has hosted and overseen over 18,000 volunteers. 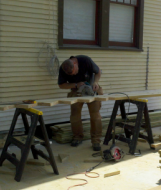 Volunteers gutted hundreds and hundreds of homes, rebuilt 110 homes in the community, and worked in environmental causes, food pantries, and with young people. Your partnership with Annunciation has been a catalyst to do so much. When it came time to expand the preschool and downsize the guesthouse, we thought only one more year would be ahead of us. That was four years ago. Four years is a long time for a farewell tour by any act! We have been blessed to get four more years with so many of you. Four more years of good work with good friends, serving a great city. This was in some ways a difficult decision and in other ways an easy one. We knew the day would arrive when it was time to close the guesthouse. It’s not that the work is finished in New Orleans; far from it, because we are focused on a new New Orleans that combats racism and economic injustice. As the great call from our Broadmoor neighborhood has been since Katrina, we work for our community to be “Better than Before.” That kind of work will take a lifetime, and we are committed to it as a diverse congregation. But Annunciation knows after 174 years of ministry that when one opportunity ends, another is around the corner. It was still a difficult decision, because we will miss hosting you all. We’ve gotten to know many of you very well. We’ve enjoyed the friendships and relationships that have developed. It’s definitely one reason we stretched this past the 10-year anniversary of Katrina. I suspect it’s also why you kept coming longer than you expected. But, we’ve been at Jena and South Claiborne since 1924 and in New Orleans since 1844 - you know where to find us! It was also difficult because of the staff that has served us all so well. An amazing group of people over the years has worked as both paid and volunteer staff. What a gift and a blessing. We are especially thankful for our current staff. What wonderful, dedicated folks! Even as we all saw the end coming, everyone kept moving forward, kept their eyes on the importance of serving you and the people of New Orleans. We hope you share the same gratitude toward our staff. We are inviting you to donate toward a thank you offering for the staff at AnnunciationEpiscopal.com/Donation . Please be generous as they have been generous to you. The campaign will run through August 31. Every penny we collect will be shared only among the staff members who work for Annunciation’s volunteer guesthouse and are ending their time with us. I’m happy to say that you’ll still see the guesthouse staff when you visit New Orleans. They are all active members and attend Annunciation regularly. Finally, we hope you will join us next spring in 2019 for Annunciation’s 175th Anniversary. Near the anniversary of our founding on March 25, we will celebrate all the goodness from our past as we look forward to our future. If you want to continue to volunteer in New Orleans and need dormitory space, we suggest Molly’s House at Trinity Episcopal Church. It’s a beautiful house, built five years ago to house volunteers. It can accommodate 24 guests with bathrooms, a large kitchen, and living room. For more information, go to trinitynola.com/mission or contact Trinity’s Mission Coordinator at (504) 670-2571 or tlfcoordinator@trinitynola.com . And of course, we will be happy to visit with you! Molly’s House is 10 minutes away from us. Thank you for the last 13 years. Welcome to Annunciation's Guesthouse page! Since 2006, Annunciation has welcomed over 17,500 people in its dormitory over the last ten years. We have embraced the ancient Benedictine tradition of welcoming everyone, regardless of their background. This ethos is a central part of Annunciation's mission and way in which we support our beloved city. The majority of people who stay with us are from churches, colleges, and high schools who are coming to New Orleans on a mission trip or service learning trip. So often on mission trips and service projects, the ministers and project coordinators spend the entire week on logistics. Little time is available to work alongside your participants. Our goal is to offer a "Mission in a Box" so everyone can work together. We do this by providing clean and relaxing accommodations, delicious meals, and rewarding service projects*. Worship, prayer, and reflection space is offered. As someone born and raised in New Orleans, I want to thank you for considering New Orleans for your next mission or service-learning trip. We've come a long way since Katrina. But as many folks know, the problems which plagued New Orleans existed for many decades before 2005. While the hurricane and levee failure which followed served as a catalyst for Annunciation's efforts to help rebuild New Orleans, we recognized early on that we could not simply restore New Orleans but, in the words of our Broadmoor neighborhood association, build it "Better than Before." Finally, when we are not housing mission and service learning groups, we are also welcome guests who are looking for a quiet and safe respit from their travels to our city. Most often this includes people who are looking for a retreat space, volunteering on an individual basis, coming here for education and learning, or families with a loved one at a nearby hospital. If you woud like to stay with us, please reach out to our Guesthouse Coordinator, Robin Yeager, at volunteer@annunciationepiscopal.com or 504-895-8697 x2. Chef Earl Fontan explains why we do what we do at Annunciation. He was interviewed in 2015 as part of the 10th Anniversary of Hurricane Katrina. The dorm rooms are located on the 2nd floor of the church. They can hold up to 32 people most of the year. During Spring Break and the Summer, we do have extra space to accommodate larger groups up to 50. The rooms have on average four bunk beds each and can sleep a maximum of 8 people. We provide all the bed linens (sheets, blankets, and pillows) as well as towels for each person. The facility meets all the state and city safety and fire regulations. We have a smoke and fire detection system as well as sprinkler system throughout the facility. We are especially proud of our meals. There will be three meals a day Monday-Thursday with breakfast and lunch on Friday. A light breakfast is service on Saturday. At our meals, we incorporate local dishes and customs. For instance, in the Spring, we always serve Louisiana Strawberries and during the winter, Louisiana citrus. Community Coffee, a local favorite, is served throughout the day. Our kitchen is overseen by a retired New Orleans chef, Earl Fontan. Chef Earl has over two decades of restaurant experience. Having joined our staff in 2014, he is excited about the opportunity to serve volunteers who come to serve the people of his hometown. Breakfast is served from 6:30am-7:45am Monday-Saturday. It is always hot and includes eggs, sausage or bacon, fresh fruit and some of the following each day: oatmeal, grits, hash browns, biscuits, cinnamon rolls. Coffee, milk and juice are also served. Again, we proudly serve Community Coffee. Lunch is a bag lunch and is offered Monday-Saturday. At breakfast, we set out items for each volunteer to make their own sandwiches. It includes sandwich items (some days Leidenheimer's french bread), chips, snacks, and fresh fruit. The Dinner is served Sunday-Friday from 5:45pm-7:00pm. Each dinner includes salad and dessert: Monday - red beans and rice; Tuesday - Italian (varies from chicken parmesan, eggplant parmesan, lasagna, spaghetti and meatballs, or chicken marsala) ; Wednesday is our fun night - varies from tacos to hot dogs to enchiladas to hamburgers; Thursday - traditional New Orleans meal such as jambalaya or gumbo or chicken creole. All meals are prepared by our staff. Our kitchen is now managed by a retired chef, Earl Fontan. We ask for volunteers to provide some help with cleaning up the dining hall after each meal. We can also help line up your work around the community if you need help coordinating it. There are great opportunities all over the city ranging from rebuilding to environmental work to social justice to education. Some of the organizations you can work with include The St. Bernard Project, Habitat for Humanity, Rebuilding Together, St. Paul's Hike for KaTREEna, Second Harvesters Food Bank, and a number of local schools. Annunciation is located on the edge of the Broadmoor and Freret neighborhoods. Both neighborhoods flood considerably after Katrina and the residents of both neighborhoods have worked hard to build a better community than existed prior to 2005. If you come down, you will see what a success they are. Both neighborhoods are diverse, ethnically and socially. Both neighborhoods have friendly people and great places to eat.